Kate Wilkin inspects a ponderosa pine on her property with an old fire scar, undeniable evidence that fire has swept through her neighborhood in the past. Fire scientist Kate Wilkin was on the job just a few weeks when ferocious winds whipped up the Northern California firestorm of 2017. The national media focused on Napa and Sonoma counties, where the deadly Tubbs fire became the most destructive wildfire in California history, while devastating fires also broke out in Butte, Nevada, Yuba and other counties. It was crunch time for Wilkin, who stepped in as the new forestry, fire science and natural resources advisor for UC Cooperative Extension in Sutter, Yuba, Nevada and Butte counties that fall. Four lives and 200 homes were lost in her new work community. Wilkin will now host workshops to help families and businesses recover from the firestorm and rebuild in a way that is more resilient to fire. Fire resiliency will start at her own home. The Wilkin-Johnston home is at the top of a rise dotted with cedars, ponderosa pines and black oaks. The dying plants in the foreground are Himalayan blackberry bushes that were treated with glyphosate (RoundUp) to remove them. The invasive weed forms a continuous understory that climbs into tree canopies and can carry fire with it. 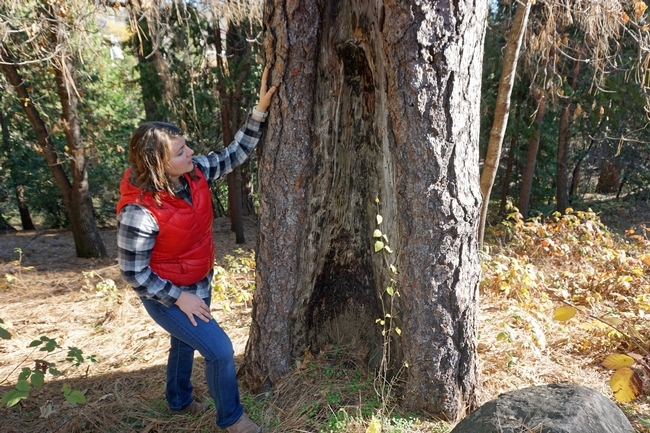 Wilkin removed one blackberry stem from a cedar tree that was more than 30 feet long. Wilkin and her husband Josiah Johnston moved into their first home, a ranch-style rambler atop a hill in Grass Valley, on Sept. 15, three days before Wilkin reported to work in the Sutter-Yuba County UC Cooperative Extension office in Yuba City. The couple moved from a small apartment in Berkeley, where Wilkin was conducting research as a post-doc in the lab of UC Agriculture and Natural Resources researcher and UC Berkeley fire science professor Scott Stephens. 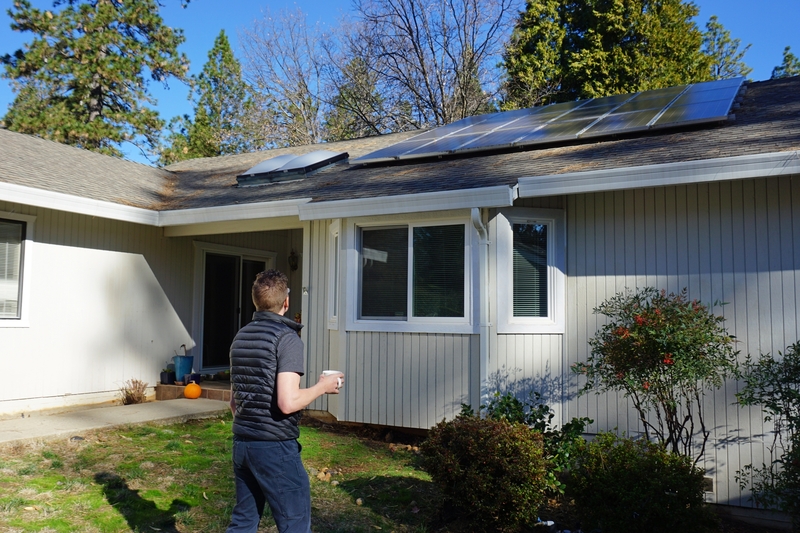 The move from a hyper-urban Bay Area city to a small hamlet in the hills wasn't too much of shock to their systems. Johnston was raised on a farm with chickens and goats. Wilkin grew up in the rural Appalachia community of Abingdon, Va. After completing her bachelor's degree at the College of William and Mary, an internship with the Nature Conservancy in Kissimmee, Fla., introduced Wilkin to fire science. What better place to continue a fire education than California? Wilkin enrolled at CalPoly, San Luis Obispo, earning a master's degree in biology. She spent the next three years in Yosemite National Park, working with a team of scientists to understand the impacts of packhorse grazing in mountain meadows. “We found that the current policies led to meadow degradation,” Wilkin said. Yosemite then changed its policy to reduce the amount of horse grazing on these tender, sensitive mountain resources. 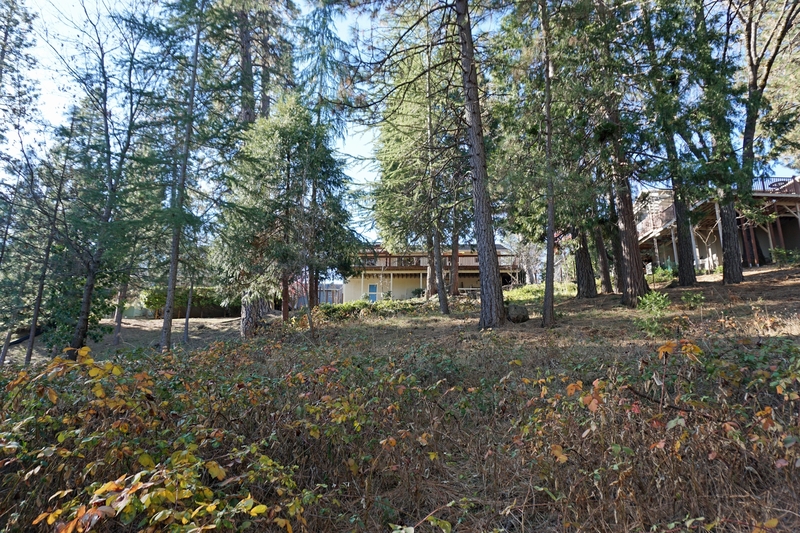 Kate Wilkin and her husband Josiah Johnston in front of their Grass Valley home. In 2011, Wilkin started work on her doctorate at UC Berkeley, where she studied the relationship between fire, forest diversity and water. Wilkin signed up for the pilot Graduate Students in Extension program at Berkeley, launched in 2014 to train and recruit graduate students for careers in research and outreach. The railing and both sides of the siding on the deck were covered in wooden lattice by the previous homeowners. Wilkin and Johnston found a squirrel cache between the layers of lattice, with acorns, pinecones, needles and other dry plant debris. “It was the perfect place to start a fire,” Wilkin said. 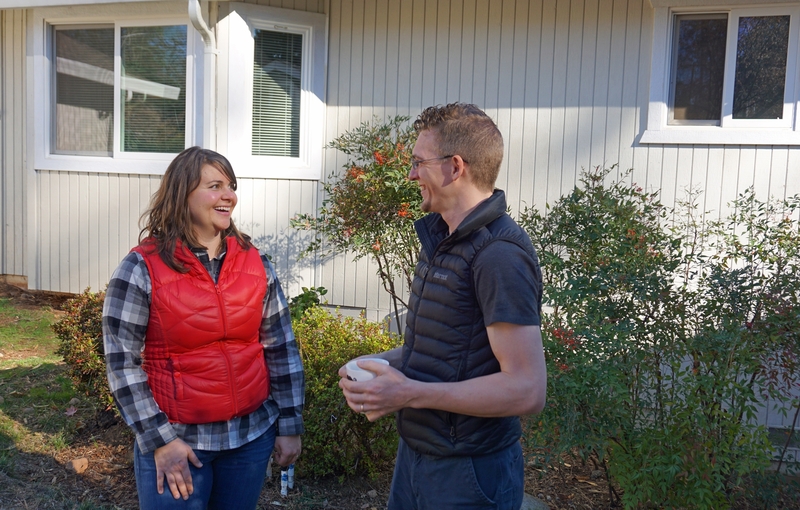 With full knowledge of the dangers of living in fire-prone areas, Wilkin and Johnston purchased a home close to the outdoor amenities they adore – hiking, backpacking and skiing. As a fire scientist, Wilkin was well equipped to make changes to the home and landscape to minimize the risk. 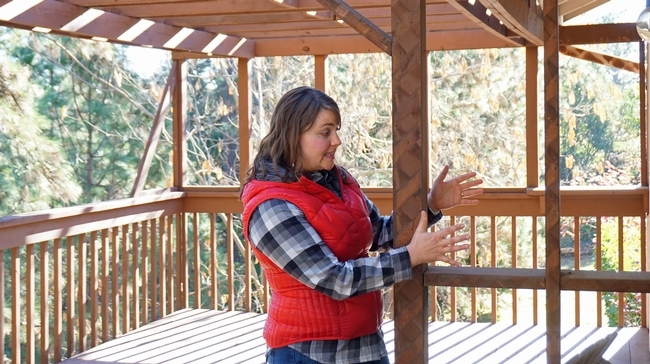 “We moved in during peak fire season,” Wilkin said. “We didn't hang artwork. My priority was to make the home and deck more fire resistant. We put in one-eighth-inch mesh over the vents, caulked around doors and windows, blew leaves off the roof and deck, removed lattice wrapping the deck and cleaned the gutters. Then we created defensible space starting close to the house and working our way outward." The couple labored about 200 hours and spent about $800 in the first six weeks buying and renting tools, including a chipper, saw and a truck to haul away tinder-dry lattice, foliage and pine needles. With the most critical fireproofing completed, the couple is now tallying the work that should be done to further enhance the fire safety of their home. “We probably need another $6,000 to $7,000 of work,” Wilkin said. 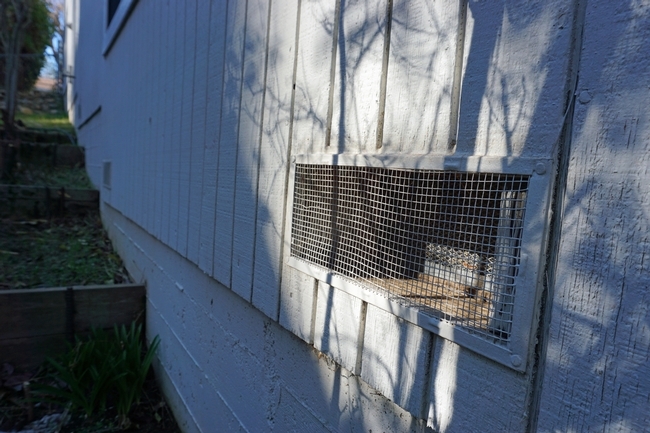 To reduce large, hot embers from drifting into the basement and starting a fire in the home, Wilkin and Johnston installed one-eighth-inch mesh over the vents. Before next fire season, they will upgrade to vents that close during fires. Wilkin recalled the terrifying time about a month after moving into their new home when howling winds whipped around the house and fires were breaking out across Northern California. Wilkin and Johnston were fortunate. The closest fire to their home was the McCourtney Fire, which burned 76 acres in Grass Valley. The wildfire stayed two miles away. 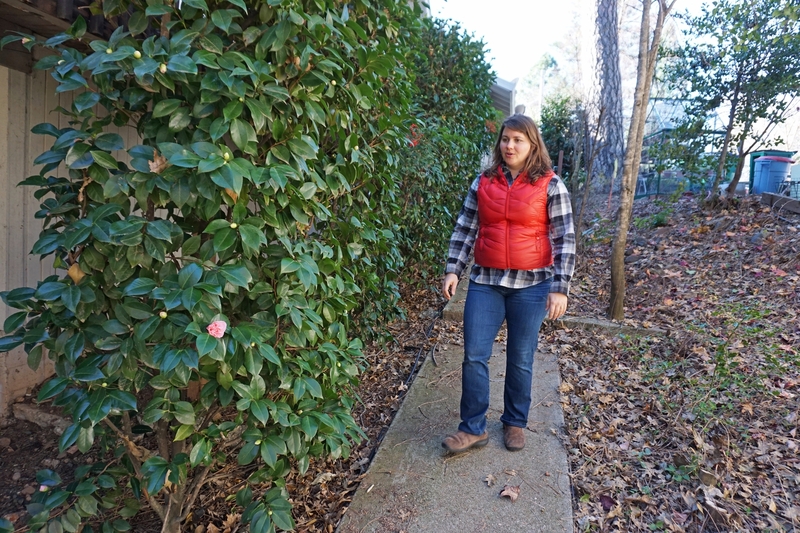 A thick hedge of camellias borders the side of the home. Although ideally homes should have a five-foot zone immediately surrounding the house clear of burnable objects and plants, she didn’t have the heart to pull them all out when they were full of flower buds, but removed them after they bloomed. Complex features on the roof – such as skylights, solar panels and a valley that can capture debris – require frequent maintenance to keep the roof fire safe. Johnston tacked down loose flashing on the roof and blew leaves off the roof and out of the gutters. The previous homeowners installed a shrub-lined wood fence that went under the deck and attached to the house. “It was a perfect way for a fire to wick into the house,” Wilkin said. 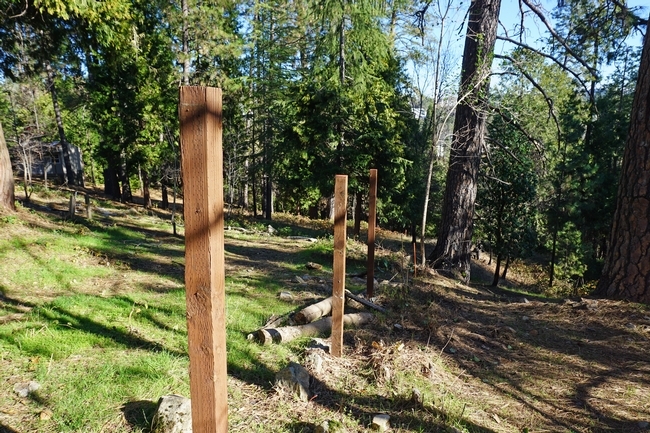 The couple removed the shrubs and fence slats and plan to remove the posts as well. Great article. Gave me a few things to think about in my own yard. Your talk to our Butte Co. Master Gardeners was fascinating. What do you know about metal roofs? When considering a roof's fire resistance, you need to consider the material, how it is put on a home, and its maintenance. Metal has some strengths and weaknesses when you think through these ideas. Metal roofs are composed of metal, which is fire resistant. Metal roofs often have gaps at the base of the roof and along ridgelines that make perfect homes for birds, small mammals, and insects. 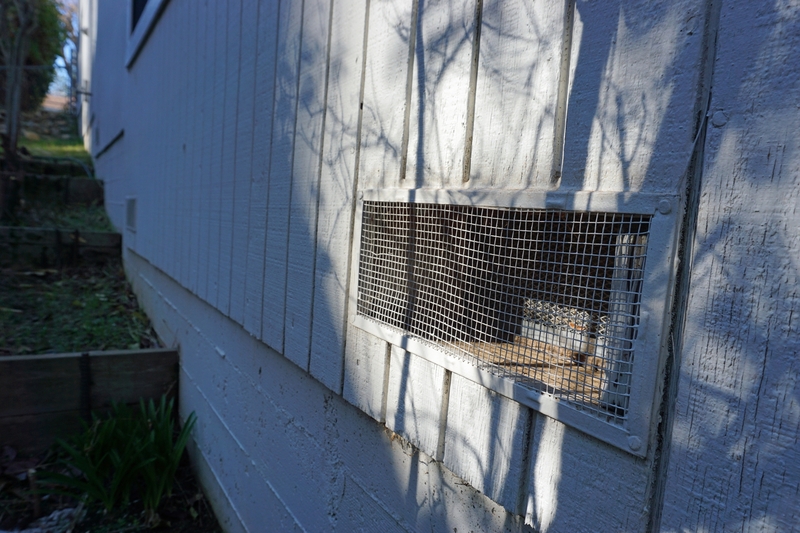 When critters make nests in these areas, especially along the roof drip line where the nests are touching the wood decking, this creates a pathway for an ember to ignite the home. You can mitigate this concern with routine maintenance to fill these gaps. With regular maintenance, metal roofs can be part of a fire resistant home.